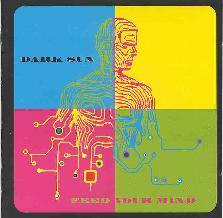 Dark Sun - "Feed Your Mind"
Dark Sun is a seven piece pop-space-psych-metal band from Finland. Instrumentation includes guitars, bass, percussion, sax, violin, loads of keyboards and synths, and.... space whispers! Totally psychedelic lyrics are in English. At the time of this writing I've had Dark Sun's disc less than a week and I can't seem to get it off my CD player. The band combines Porcupine Tree's cool psych-pop sensibility, with Hawkwind's balls to the wall, crunch 'n munch space rock. Three of the songs, "Tiny The Man", "Feed Your Mind", and "Our Man Inside" are very pop-oriented tunes. But these are wonderfully crafted songs featuring great music and synths tripping in every direction. Finally, pop music that rewards the attentive listener. At the other end of the spectrum is the heavier side of the band. "Astral Magic" is a full-blown Hawkwind space cruncher with blazing guitars and flowing synths. In fact, the first time I heard the opening of this tune I thought it was going to be a cover of "You Shouldn't Do That". "Black Spires" and "Abduction Files" are also great examples of the heavier rockers. The closing number, "The Next Step" is a beautifully trippy instrumental finale that combines Porcupine Tree's Sky Moves Sideways with Wish You Were Here. Overall, this is a great disc that should appeal to a variety of space/psych fans. It manages to cover lots of stylistic ground while maintaining a clear identity. Recommended. You can visit Dark Sun at their web page.